Spanish teaching in India is a relatively new phenomenon, and as compared to the most widely taught foreign language, French, it is still behind in the game. However, it is certainly the fastest emerging language, not only in schools but also in language academies, universities and professional institutions. The formal pedagogy of Spanish in India began in 1958 at the School of Foreign Language (Ministry of Defence) and very soon, in the following decade, the University of Delhi began teaching Spanish and later on it emerged in serious pedagogy at the Spanish departments of JNU and DU. Today, it has spread to dozens of universities, including those which are offering full time honours and post graduate courses such as JNU, DU, EFLU, Doon University, AMU, AMITY along with other universities which offer part-time courses. The opening of the official Spanish language Institute, the Instituto Cervantes in 2009 is a milestone in Spanish teaching in India. Not only has it helped spread Spanish among adult learners, but school students too have evinced interest. Moreover, the institute offers Spanish language teacher’s training as well. It certainly has helped to increase the number of Spanish teachers in schools across the country. Today, due to globalization, the migration of a large chunk of urban population across the globe and the setting up of several MNCs in India alongside the internationalization of the education sector, Spanish has established itself as the most popular second language at the International Baccalaureate and Cambridge curricula schools. The popularity has even reached CBSE and ICSE schools. However, the proposed three-language formula at schools is going to affect Spanish teaching at the schools of national curricula (CBSE, ICSE) a lot. The advent of IB curriculum in the country in 1976 was a watershed moment in the schooling culture. Their innovative teaching approaches, flexible curriculum, focus on an international outlook, foreign faculty members and international students, was a fertile ground for experiments such as offering foreign languages seriously. In fact, second language is one of the major components in the higher secondary classes for IB, and since most of the students aim to attend international universities, having studied a foreign language proves to be an edge. Apart from AB Initio (this is a higher secondary diploma offered by International Baccalaureate, Geneva) in IBDP, there is a possibility to carry on Spanish B in many IB schools, and students who have done Spanish B are expected to use the language proficiently. This is likely to have a major impact on the education culture and economic ecology in the long run. Schools like Dhirubhai Ambani International School even carry out student exchange programmes to Spain. Just imagine the broadening of cultural horizons of the participants and the impact on their life goals. The traditionally elite CBSE, ICSE schools such as Modern Public School, Sanskriti School, Doon School, Mayo College and the like also offer Spanish. But this is more to stay in the game and achieve the elite status that offering foreign languages brings with it. The serious didactics are missing there. However, thanks to the availability of resources, they can hire and run departments of foreign languages or take innovative steps towards modernization of schooling. Besides the international schools, and the elite CBSE schools, the third category of schools which cater to the maximum number of hard-working students as well teachers have to face big challenges in offering foreign languages. These schools have limited budget allocation for foreign languages, so on the one hand they do not get qualified teachers, as they don’t pay enough and on the other they are at the receiving end of the many bureaucratic or administrative dictates. We all know what happened with the German language in Kendriya Vidyalayas. The programme “German in 1000 Schools” launched in 2011 in a short span of a time found more than 50,000 learners at KVs, which was later scrapped by the then HRD minister Smriti Irani, seeing it as a threat to Sanskrit. Such a regressive step was further aggravated by the CBSE proposal to the HRD ministry to enforce the three-language formula at schools, by offering Hindi, English and a third Indian language. The decision is not yet final but who will choose a fourth language if this is made compulsory at CBSE schools as it is proposed? (It seems that the HRD ministry has since postponed the decision till 2019-20) This will be a hazardous moment in a student’s life, especially those who are caught in this whirlpool. Just look at our neighbour China! They have recently begun offering Spanish, German and French in their government schools, apart from Russian, Japanese and English which they have been offering for a long time. This fiercely monolingual country knows that in the era of globalization, developing nations need the western world more than they need us. Especially, if one is to grab a share of the global market, be it in the knowledge sector or in the manufacturing sector. Spanish language in Indian schools does not seem to have a smooth ride other than in the international schools. However, we hope that the shadow over its future is cleared in the coming days and the Indian students even before joining the universities reap the benefit of the growing importance of this global tongue. The author is currently a PhD scholar at the University of Hyderabad. He has taught Spanish at Sreenidhi International School, Indus International School and Sancta Maria International School in Hyderabad. 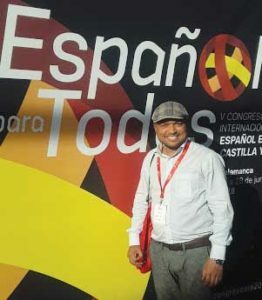 He is also founder of the Spanish learning portal www.spanishbolo.com. He can be reached at founder@spanishbolo.com.